This quark detector was technically a highly sophisticated magnetometer, designed to exclude all external noise, no matter what the source. Protected from influences ranging from subtle electrical or magnetic signals all the way up to loud sounds coming from the outside, and even the vibrations from heavy trucks driving by on El Camino Real almost a mile away, this created a super-quiet internal environment where the tiny blips of passing quantum particles could hopefully be registered and identified. 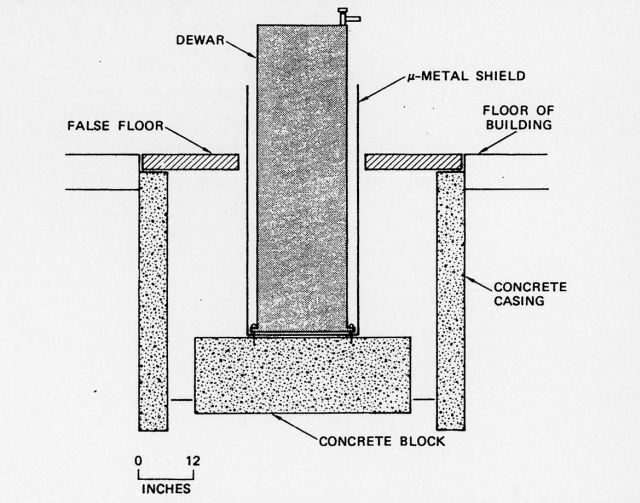 Diagram of exterior of quark detector in Varian Physics Building. Responding to a letter Puthoff had sent to polygraphy pioneer Cleve Backster, Swann had a few weeks earlier offered his mental powers as an aid in Puthoff’s quest to try to establish the existence of tachyons, a theoretical physics particle that could possibly go faster than the speed of light. I have described this event previously, both in my book Reading the Enemy’s Mind and in this blog for an earlier anniversary of the event (“It Could Have Been That Remote Viewing Never Happened”). For your enjoyment on this 45th anniversary of the event, here is a recent Skype video of Hal giving an account of the Varian Physics experiment. And just as enjoyable, go here to read Ingo Swann’s own detailed account of that experiment. 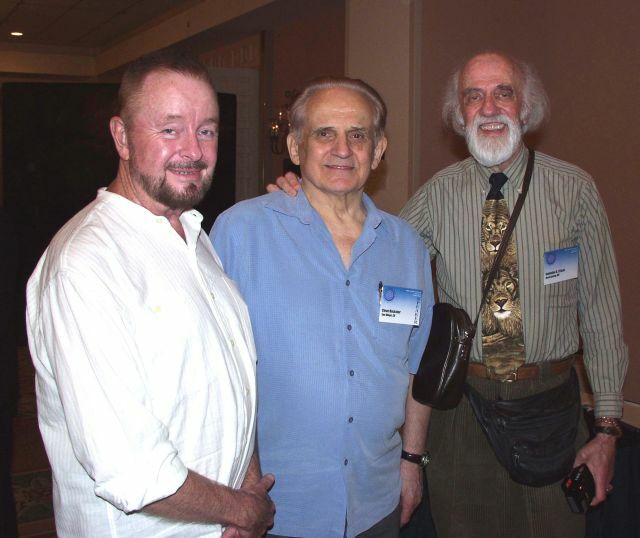 Ingo Swann with Cleve Backster and friend Stanislav Ojac during the 2002 Remote Viewing Conference. 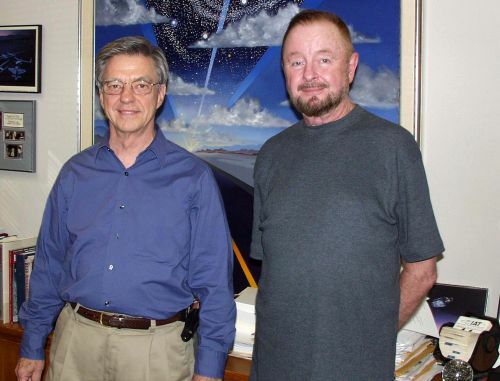 A postscript to the story, if I may: Fifteen years ago, in June 2002, the International Remote Viewing Association celebrated the 30th anniversary of this key event. By design we at IRVA worked hard to bring together Ingo Swann and Hal Puthoff for the first time in many years to celebrate the event. Ingo gave a long two-hour long talk called “Expanding the Information Base About Remote Viewing,” in which he explored the interface between the everyday mind and the profundities of consciousness. Hal Puthoff presented “Remote Viewing: Classified Beginnings,” in which he gave a version of the quark detector story linked above. And Cleve Backster, the matchmaker who had brought Ingo and Hal together, was also there to give a talk. 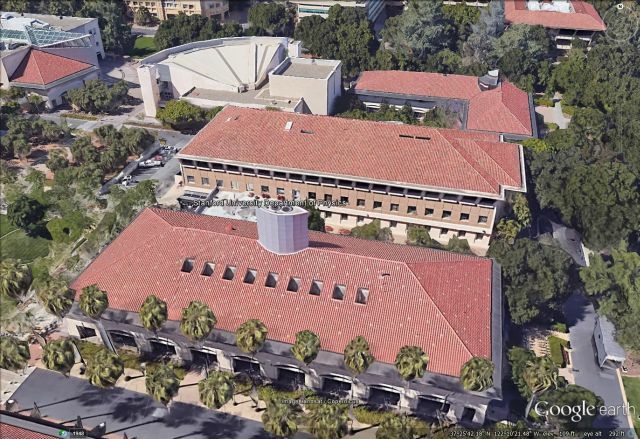 They were joined by other remote viewing luminaries, making this one of the most memorable conferences the remote viewing community has ever seen. 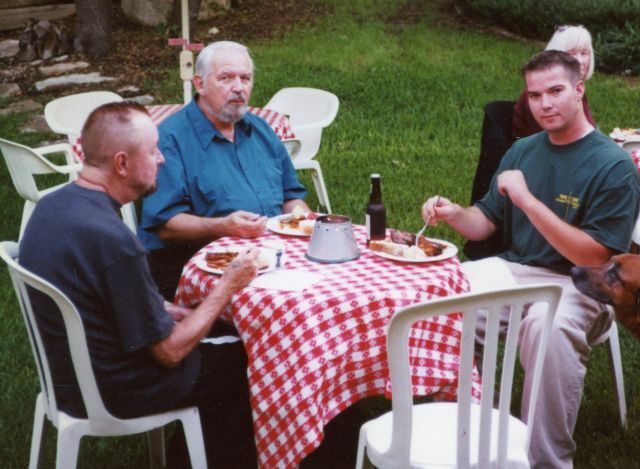 Ingo Swann (L), Lyn Buchanan, and the author’s son, James at the Puthoff’s dinner party during the 2002 Remote Viewing Conference. Afterwards, Hal and his wife hosted a reception and dinner in their shady Austin, Texas backyard honoring Ingo Swann and inviting those folks who knew him, and their guests. There have been many enjoyable viewing conferences since, but this was probably the last time so many of the pioneers of remote viewing were together in one place. Since then Ingo and Cleve have passed on, and our own time will come too soon. But thanks to that day 45 years ago, we have so many inspiring memories to share and build upon–memories, we hope, that will have their own effect on expanding human consciousness.